Innovative design and functionality, with Perger-Porro prism, custom ballistics, environmental sensors (atmospheric pressure, temperature, inclinometer). Superb optical performance with multi-coated HD lenses. Wide FOV (342 feet) for a 10x magnification binocular. The high performance optics, and game changing ballistics computing will impress even the most demanding long range shooters and hunters. There is simply no better rangefinder binocular on the market today. I am excited to finally be posting my Leica Geovid HD-B review, which are perhaps the most technologically advanced rangefinder binoculars that has ever been released to the consumer market. 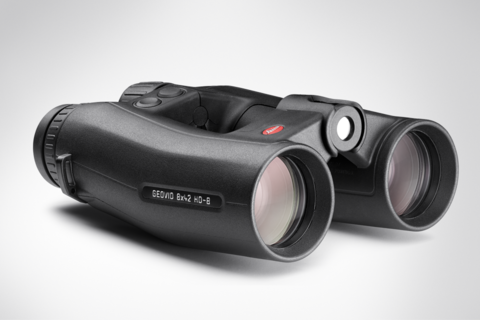 The original Leica Geovid HD 10×42 rangefinder binoculars were released all the way back in 1992, and at the time they were breaking new ground in the optics world. Fast forward to today, with all the new technology available, and Leica has done it again, this time with the new and vastly improved Geovid HD-B. The new Leica Geovid HD-B comes in 8×42 and 10×42 magnifications, features premium lenses and coatings, and their exclusive Advanced Ballistics Compensation system. You can actually fully customize rangefinder to the ballistics profile of your choosing with the integrated micro-sd card slot. Think about that for a minute! Yes, the price is steep, but for that level of technology, the Leica Geovid HD-B could be the last binocular OR rangefinder purchase you ever need to make. Sport shooters who enjoy competitions and taking long range shots. Shooters who spend much of their time hunting in the mountains. Hunters who spend their time in the prairies and grasslands of the west. The video below, shows exactly how the Geovid HD-B makes determining your aiming point faster and more precise. You’ll see the effects of gravity, air pressure, humidity, inclination and bullet type affect your impact point. It really is the best video I’ve seen demonstrating how powerful this binocular really is. The Leica Geovid HD-B comes packaged with all the basics you need to get started. There is a neck strap, carry bag, front and back lens covers, cleaning cloth, micro-sd card, operations manual, warranty card, and finally a test certificate from the Leica production floor. The Geovid HD-B boast a very unique design, thanks to the newly designed and patented Perger Porro Prism system. The porro prism is technically a superior optics system, but the main disadvantages are typically increased cost and bulk. The trend in todays top binocular designs, is to use roof prisms to maintain the compact size that hunters demand. However, when you look at the Leica Geovid HD-B, you see that the overall housing shape is extremely efficient. There is basically a tiny computer inside controlling the laser range-finding system after all. The housings have a slight downward bend to them, which ends up improving your grip and being more ergonomic. The Geovids are very easy to hang on to and hold to your face. There is a center mounted focus dial, with the smooth and fine control you’d expect from a Leica product. There are 2 buttons at your right index finger. The first is for selecting settings on the rangefinder, and the second is for making actual range measurements. One button is concave while the other is convex so you always know which is which without looking. The eyecups are of a similar design to other Leica binoculars. The Geovid HD-B has 5 different positions that are set by twisting the eye pieces. Each eyepiece has a diopter control to help you compensate for the slight differences in sight between your eyes to get the perfect focus. This dual control also is useful to get the best focus on the internal rangefinder display. Leica has spent a load of cash and engineering resources on research and development of the Geovid HD-B. The original Geovid used a roof prism design, but the new HD-B version features an all new patented “Pergo Porro” prism design. The commonly held belief is that roof prisms are superior to porro prism binoculars, but that has been debunked by several sources. Companies has chosen to focus their design efforts into the more compact roof prisms because that is simply what consumers have demanded. The field of view is a whopping 342 feet (at 1,000 feet), which is the largest FOV of any rangefinder binoculars available on the market today. There are multiple coatings on each lens including HDC, anti-reflective, hydrophobic, and P40 phase correction coatings. This adds up to provide a stunning combo of high light transmission with low chromatic aberrations. Most users of the Geovid HD-B will use them for long range shooting, so the 10×42 is the more popular size, while the 8×42 size does boast a brighter image. The internal display gives you several data choices, including line of sight distance and equivalent horizontal distance, temperature, and even atmospheric pressure. Then uses the Bullet Drop Compensator function to display the number of clicks needed to adjust your reticle (in units of 1 MOA, ⅓ MOA, ¼ MOA, and 10mm/100m, or 5mm/100m). 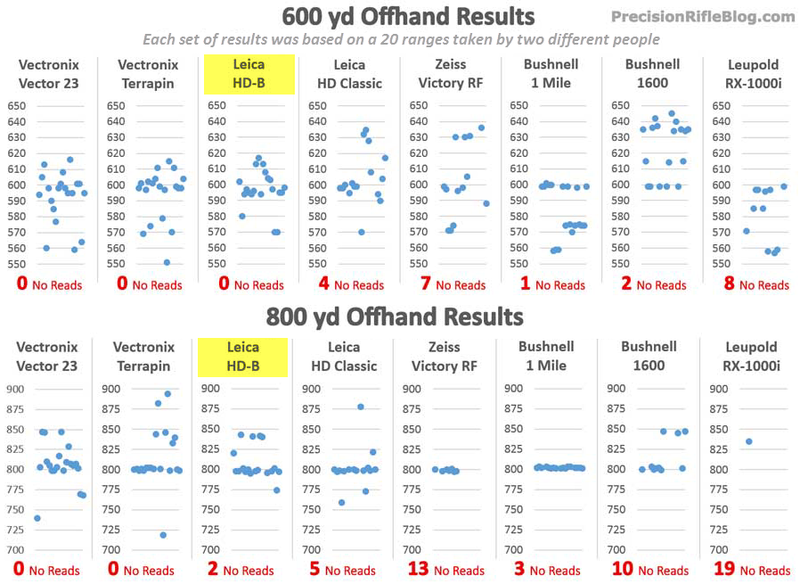 The Precision Rifle blog has an excellent Leica Geovid HD-B review with detailed data regarding the ranging performance of the binoculars. To summarize for you, the accuracy has been improved in a big big way. Precision Rifle was able to get accurate readings for smaller targets all the way out to 1,950 yards, and larger targets out to 2,200 yard. 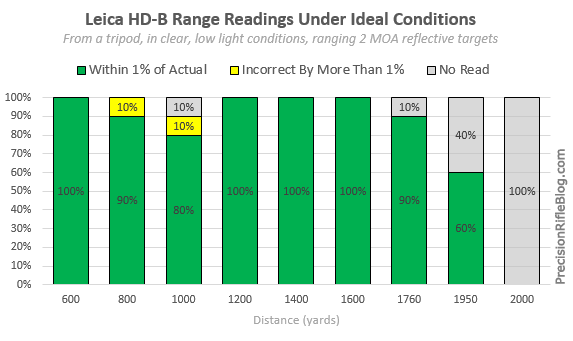 90% of the time the Leica HD-B gave ultra fast and accurate readings under the ideal sighting conditions. The sun emits radiation that can interfere with the laser readings, causing the range readings to be more difficult to obtain. Under these circumstances, the HD-B was much better at ranging mid to short range targets. Custom ballistics is where the Geovid HD-B really shines. Where other rangefinders limit you to a handful of pre-programmed ballistics curves, the Leica Geovid HD-B is almost completely custom. It supports G1 BC ballistics coefficients, but not yet the G7 BC that is better for long range ammunition. Using the Geovid HD-B Ballistics Calculator on the Leica website, you can upload the load specifications for your specific firearm, all the way down to the bullet, grain, weight, and ballistic coefficient. This allows it to calculate the precise holdover distance is required for your specific load. Leica has spent years and millions of dollars on their reputation for quality. When you purchase a Leica product, you are getting a pretty stout 5 year limited lifetime warranty. Be aware though, that if you are not the original purchaser, the warranty does not transfer, and you must purchase from an authorized Leica dealer. great disappointment with my set of Geovid B 8 power. Having tested them in the field for some months now I have found that the right hand eyepiece windout has jammed and cannot be wound in. My other criticism of them is that the eyepiece covers have been poorly designed. A lot of hunters these days tie these to the bino with a piece of strong string so as to flick them off and on to keep out vegetation and the like when wearing on a harness. I have to say that they do not hold on for more than a few seconds! I quite regret getting rid of my old HD geovids now and buying the B model. Disgraceful really. Leica you should listen to your customers. And a five year warranty?? Hmmm. What’s the Best Binocular Harness for Hunting?